Temp-Wrap™ will wrap around any diameter of cylinder for maximum heat retention. Three basic components combine to form a continuous insulation wrap that prevents expensive heat loss from heat pipes and the barrels of molding machines. The “Starter” is mitered to provide a squared begging to the wrap. 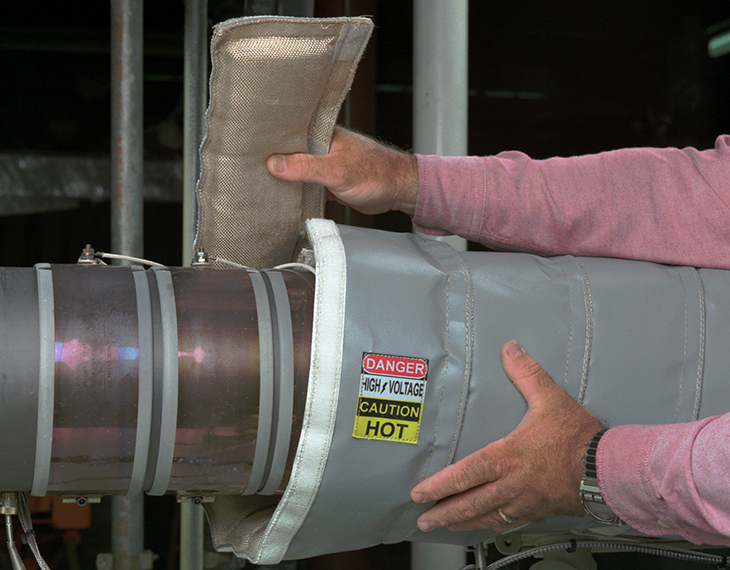 The “Middle Section” then serpentines around the cylinder, fastening to itself with high temperature Velcro®. Additional sections may be added until the entire length is covered and then a “Finisher” is connected, also mitered to provide a square end. The result is a well insulated application utilizing “off-the-shelf” insulation that may be re-used in other situations. Another advantage to Temp-Wrap™ is the many exit points it offers for wire leads like those necessary for pressure transducers, thermocouples leads, etc. As the insulation is wrapped it can allow these wires to exit between the gaps.